This article is about the ship. For the fictional character in Mervyn Peake's Gormenghast novels, see Barquentine (Gormenghast). A barquentine or schooner barque (alternatively "barkentine" or "schooner bark") is a sailing vessel with three or more masts; with a square rigged foremast and fore-and-aft rigged main, mizzen and any other masts. While a full-rigged ship is square-rigged on all three masts, and the barque is square-rigged on the foremast and main, the barquentine extends the principle by making only the foremast square-rigged. 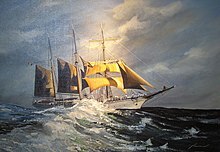 The advantages of a smaller crew, good performance before the wind and the ability to sail relatively close to the wind while carrying plenty of cargo made it a popular rig at the end of the nineteenth century. Today, barquentines are popular with modern tall ship and sail training operators as their suite of mainly fore-and-aft sails can be operated with ease and efficiency, but the single mast of square sails offers long distance speed and dramatic appearance in port. Concordia, a sail training ship that capsized and sank on 17 February 2010. Mercator of 1932, Belgian training ship. Transit, an experimental design of 1800 that could be worked entirely from the deck. Many smaller ships of the late nineteenth century Royal Navy were rigged as barquentines, including the Redbreast-class gunboats. Endurance, commanded by Sir Ernest Shackleton and crushed by ice in the Weddell Sea during the Imperial Trans-Antarctic Expedition of 1914–17. KRI Dewaruci of Indonesian Navy, launched and commissioned in 1953, still in service now; a well-known tall ship used for cadet training and ambassador of the sea, sails around the world and visits many countries. Esmeralda, a sail training ship of the Chilean Navy. Polish-built Pogoria class sail training ships: Pogoria, Kaliakra and Iskra (1982) [pl]. Southern Swan (Svanen), tall ship from 1922 re-rigged as a Barquentine from its original rigging as a Schooner. Sails on Sydney Harbour for cruises. Spirit of New Zealand 1986 is a youth development training ship. ^ Although in fact the term "brig" was a shortening of "brigantine", and for much of the sixteenth to eighteenth century the two terms were synonymous. ^ "Sailing ship rigs, an infosheet guide to classic sailing rigs". Maritime Museum of the Atlantic. Archived from the original on 28 December 2010. Retrieved 15 January 2011. ^ T F Hoad, ed. (1993). Oxford Dictionary of English Etymology. Oxford: Oxford University Press. p. 34. ISBN 978-0-19-283098-2. ^ "Thor-Heyerdahl". Segelschiff Thor Heyerdahl gemeinnützige Fördergesellschaft mbH. Retrieved 27 December 2012. ^ "Svanen web page". Sail Australia. Archived from the original on 11 March 2013. Retrieved 22 February 2013. Look up barquentine in Wiktionary, the free dictionary. Wikimedia Commons has media related to Barquentines.